What is a field guide? Although the term is often misused, a true field guide is a compact book designed for quickly identifying things in the field. It may not have room for much extra information about the subject but it is organized to help the user to recognize things quickly, to put names on things accurately. The "things" in the Kaufman Field Guides are living things, elements of nature. The Houghton Mifflin Harcourt Company (formerly just Houghton Mifflin) of Boston, publishers of books by such luminaries as Henry David Thoreau, Rachel Carson, Jane Goodall, and Roger Tory Peterson, has long been known for its prestigious line of books on nature and the environment. In October 2000, Houghton Mifflin continued this tradition by launching the Kaufman series. At first these books were referred to as Kaufman Focus Guides, but the publisher determined that people accustomed to the term "field guide" were having trouble finding the series, so they were renamed Kaufman Field Guides in 2005. Pictorial Table of Contents from Kaufman Field Guide to Butterflies of North AmericaThe hallmark of all of the Kaufman Field Guides is that they are designed for ease of use. Although the authors and editors go to great lengths to ensure that the books are accurate and complete enough to be trusted by experts, the number one goal is to make the books accessible and understandable for beginners, so that newcomers to natural history will be able to take their first steps with confidence. One example of this user-friendly approach: experienced naturalists may know where to look in the book for a particular type of creature, but beginners won't know that. And it's hard to look up something in the table of contents or index if you don't know what a "vireo" or "hairstreak" or "vole" is in the first place. 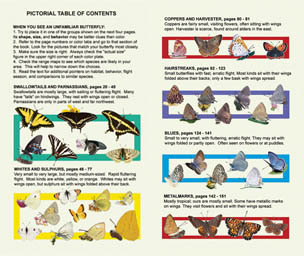 Each of the Kaufman Field Guides features a "Pictorial Table of Contents" to help beginners quickly find their way to the right part of the book (the beginning of this pictorial approach for the Butterflies guide is illustrated here). More experienced users will appreciate the "quick one-page index" on the last page of each guide. In the layout of each guide, the illustrations, text, and range map for each species are all visible at a glance. Within each book, similar species are arranged for quick comparison, and the most common or widespread species are usually emphasized at the top of the page or at the beginning of a section. The example here, from the Kaufman Field Guide to Birds of North America, shows a series of medium-sized songbirds that all have very thick beaks. The last bird on the page, Blue Grosbeak, might be confused with Indigo Bunting or other buntings, so these birds are all illustrated on the very next page.